Today I got the best news when I awoke.....a SNOW DAY!!!! Being a college student, these are very few and far between, it rarely ever happens. However, last night southeastern Michigan received about 5-10+ inches of snow, depending on where you live of course. I was extremely elated and decided to check and see if there were any estates sales. There are hardly never sales on Wednesdays so imagine my luck when there was one, close to home, and literally PACKED with TONS of vintage clothing and over all vintage goodies. My mom and I headed out and got there about two hours after the sale opened. There was still a lot of great stuff left, but I could tell that the really spectacular stuff had already sold. Nonetheless, I still found a lot of great deals and was able to cross of some more things off my look out list. Apparently, this home/store front was being used as a storage facility for the owner and he wanted to clear everything out. It was truly a digger sale, with many open boxes waiting to be looked into. In the boxes is where I found most of my deals...I am thinking the early birds didn't take time out to do so. Anyways, here is a list of all the things I got. Sorry for the lack of photos, most of the stuff is either drying or at the cleaners. The house part of the building had a whole room just full of shoes. The walls were lined with shelving and still filled to the brim with vintage shoes. This was like my dream room!! I've been looking for a new/old pair of black pumps to replace a pair I have. These fit like a dream and are so cute...I'll post pictures soon. The room also had a table in the middle with accessories. There was a shallow box full of vintage sunglasses; there must have been at least 30 pairs. 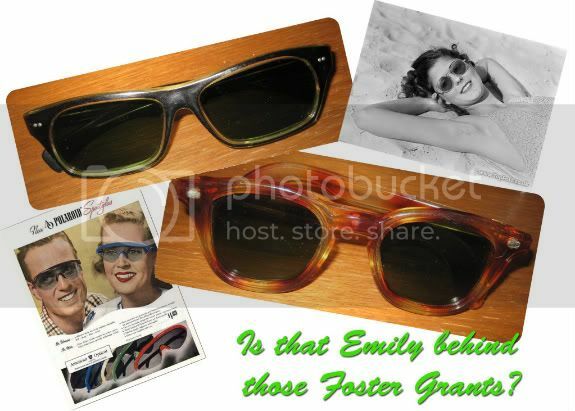 I picked out two pairs and I had no clue that the black framed ones were vintage Foster Grants until I was cleaning them at home. I think the red and orange ones look like the pair Gene Tierney wears in Leave Her to Heaven (1945). When I was looking through the racks that had the blouses on them, I can across a pink one with rhinestone buttons. I thought it was cute, so I picked it up to examine it. Would you believe my surprise when I looked at the label and it said CHANEL??????!!!! This sale actually had a lot of designer items, the guy in line behind me got a few items by Christian Dior. Since there were other designer items there, it's pretty likely the Chanel shirt is a real, but I am going to investigate the label. Regardless, it's cute and was only $2. You did well on this trip...when's the next adventure?